A niche has been cut into this natural rock face on Dalmeny beach, and within the niche is carved a very worn figure thought to represent an eagle. 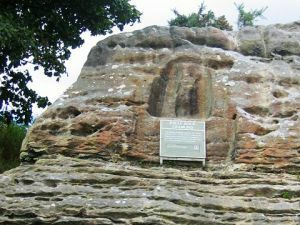 The proximity of Eagle Rock, also known as Hunter's Craig, to the Roman camp at Cramond has led some historians to suggest that the carving was made by Roman soldiers. If the figure is indeed Roman, it seems more likely that it is meant to depict the god Mercury, but even then we are venturing into the territory of guesswork, as the carving is so worn as to make further identification almost impossible. One theory, which has as much plausibility as the Roman interpretation, is that the carving is part of a pagan shrine, possibly to the god Cernunnos or Ogmios. In any case, the carving appears much more likely to represent a human figure, bearing a club over one shoulder, than an eagle. The carving is some 3.5 feet tall, and 2.5 feet wide at the base. The carving stands out over 4 inches from the rock surface, which may account for the weathering which has so badly affected it. It has also been much defaced, leaving little more than a faint outline. 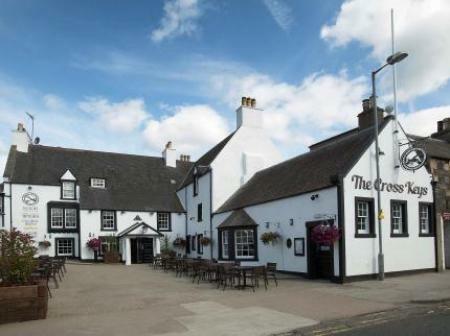 Location: Just west of Cramond off the A90. Access via a pathway from South Queensferry, under the railway bridge, into the Dalmeny Castle estate, then along the shore path for over a mile.